It's time to add some drama to the table. 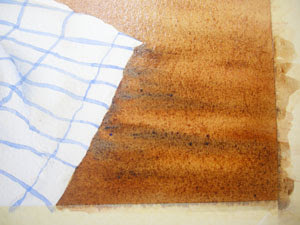 I mixed some Burnt Sienna and Van Dyke Brown to create a wash for the table. I wanted to give it some weight, a darker value and some texture like wood. First I glazed a little bit of water over the wood table area. This should make the paper damp, not puddled. 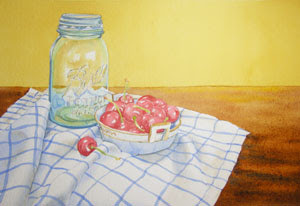 Then I used horizontal strokes of strong color and laid on some texture. The wetness of the paper helps to soften the edges. I also tried to make the strokes non-uniform and darker on the bottom right than on the upper edge. This helps to create the illusion of depth.